As noted by Grantland’s Bill Simmons, the NBA’s Eastern Conference is a “muddled mess of mediocre players, bad executives and even worse contracts.” Through a month and a half of the 2013-14 season, only three teams are above .500: the Miami Heat, the Indiana Pacers and the Atlanta Hawks. With Miami and Indiana head and shoulders above the rest of the conference, the East’s top two playoff spots are already accounted for. The rest of the conference is up for grabs. Among the most talented Eastern Conference teams going in the right direction are the Pistons. 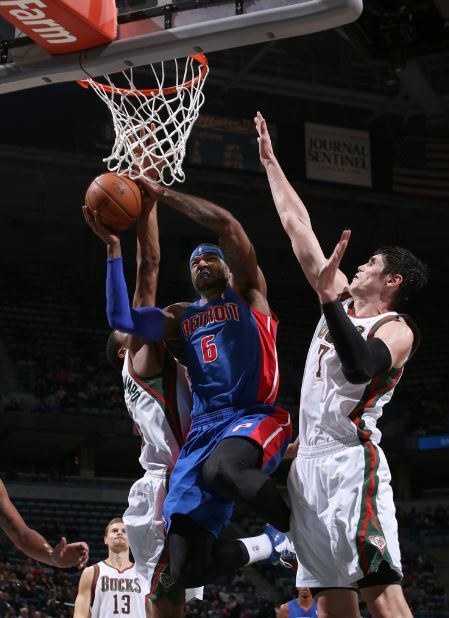 High-profile offseason acquisitions Brandon Jennings and Josh Smith are finally starting to jell in Detroit’s explosive starting lineup, while Andre Drummond is clearly taking the next step toward NBA superstardom in only his second season. Greg Monroe is one of the conference’s most consistent power forwards and rookie Kentavious Caldwell-Pope has been a seamless fit since being inserted into the starting lineup on November 15. Detroit has played its most impressive three games of the season in wins against Philadelphia, at Miami and at Milwaukee, and at 9-10 stands just one game back of .500 heading into Saturday’s game at Chicago. Currently the East’s third-place team, the Hawks were projected to finish in the middle of the pack after completely revamping their roster this past offseason. Though Atlanta has had some growing pains through 21 games, the roster has ultimately flourished with Jeff Teague and free-agent signee Paul Millsap leading the way. Kyle Korver has been as hot from three-point range as any shooter in the NBA, and Al Horford is averaging a career-high 17.5 points per game. The Hawks get help off the bench from Lou Williams, Gustavo Ayon, and Cartier Martin, but the team’s relatively weak depth suggests it won’t retain the third spot for much longer. But hey, in the East, who really knows? Without Derrick Rose, the Bulls’ stock has certainly taken a hit. But not all is lost for Chi-town. The Bulls clinched a fifth seed in last year’s NBA playoffs, and gave the eventual champion Miami Heat a brief scare in the Eastern Conference semifinals—all without Rose. Swingman Luol Deng is having a career season in the final year of his contract and Rose recently left open the possibility of a late-season comeback. Depending on GM Gar Forman’s mindset at the trade deadline, the Bulls could potentially still be intact to make a late-season run, with or without Rose. The Wizards are one of the few mediocre Eastern conference teams that aren’t (a) thought to be tanking for next year’s draft or (b) a huge disappointment. Washington has a young, improving roster that has potential to break through in the East. And if there’s any season to do it, it’s this season. The Wizards have won four of their last six games after Bradley Beal went down with a left knee injury, but have struggled to gain consistency due to poor shooting by Beal and John Wall. The two combined are shooting just over 40 percent from the field and 37 percent from three-point range. The Nets have been awful this season, and that’s putting it mildly. Head coach Jason Kidd is dealing with an overpaid, old and injury-riddled roster that has simply not performed anywhere near what was expected going into the season. Kidd himself is dealing with the growing pains of being a first-year head coach, and his recent demotion of top-assistant Lawrence Frank shows just how ugly things are getting in Brooklyn. With all of that being said, the Nets, when healthy, have one of the most experienced and talented rosters in the NBA. Perhaps offseason acquisitions Paul Pierce, Kevin Garnett, and Jason Terry are well past their primes, but they know how to win. The health of Deron Williams, who’s scheduled to return from an ankle injury on Tuesday, will probably be the single most important factor to the team’s success. As of now, the Nets aren’t a favorite for the third seed, but could be deadly come playoff time if they’re able to sneak in as the East’s fourth or fifth seed.